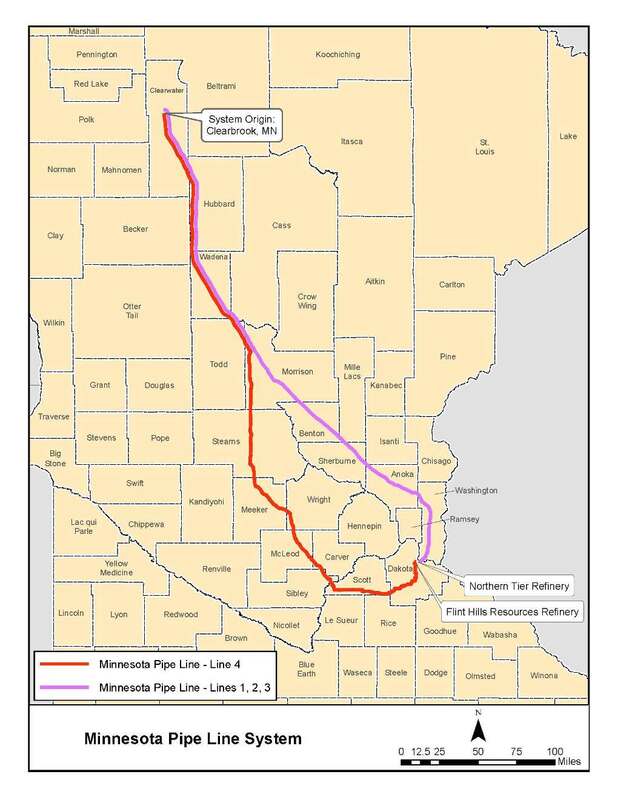 Minnesota Pipe Line Company, LLC (MPL) owns a pipeline system that transports crude oil to the two Twin Cities refineries that produce much of the transportation fuels used in Minnesota and throughout the Upper Midwest. The MPL system receives crude oil from other pipelines systems at a terminal in Clearwater County and transports it to the two Twin Cities refineries. These refineries produce much of the transportation fuels used in Minnesota and throughout the Upper Midwest. The MPL system has four lines. The first pipeline in the MPL system was established in the 1950s, and the last pipeline was constructed in 2008. The crude oil comes from North American sources including Canada and North Dakota and is delivered to refineries in St. Paul Park and Rosemount, Minnesota. MPL is the primary pipeline system that supplies crude oil to two Twin Cities refineries. MPL is owned by Marathon, Flint Hills Resources, and Trof Inc. The MPL system is operated by Flint Hills Resources (FHR). FHR owns or operates more than 4,000 miles of pipelines that transport crude oil, refined petroleum products, ethanol, natural gas liquids, and chemicals.